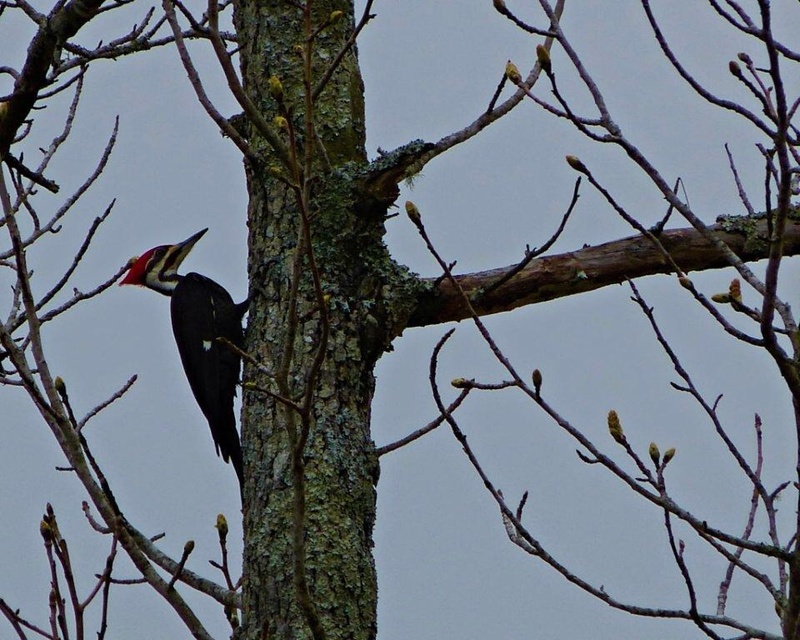 Pileated Wood Pecker near campsite. We drove from Fountainbleau State Park to Sam Houston Jones State Park, near Lake Charles, Louisiana. The park consists of 1,087 acres in Calcasieu Parish and is a great place for hiking and birding! 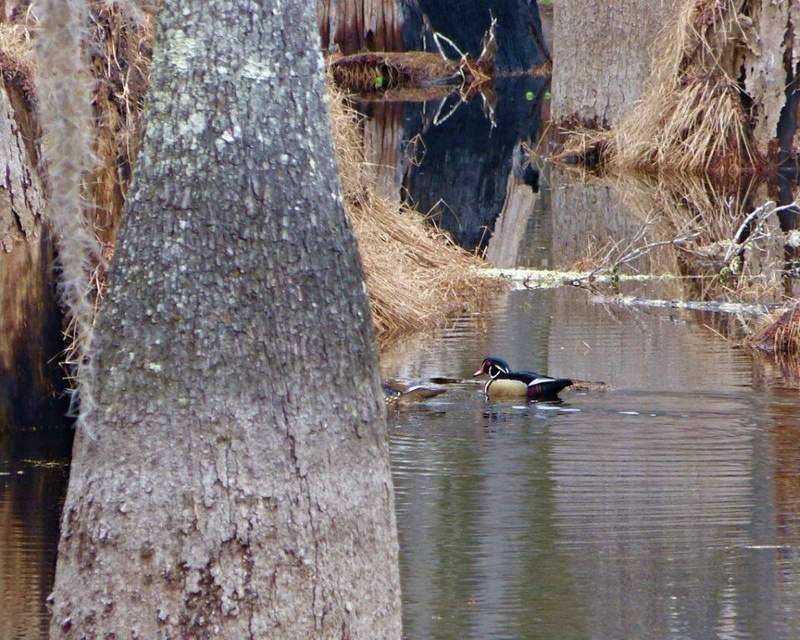 Wood Duck in the adjacent swamp. The camping area of the park is divided into improved sites, at $18 per night, and premium sites, at $20 per night. Both provide electricity and water, but the premier sites are larger and have hard topped pads. Of course, I had reserved the less expensive site, so we are dealing with mud! There are a few tents, some travel trailers and some larger RVs in the improved site area. Many of the sites are vacant, as it is still early in the season. Best of all, the campground laundromat is free! There are three washers and driers, all in working condition and we managed to get our laundry done before going for a hike along the river. 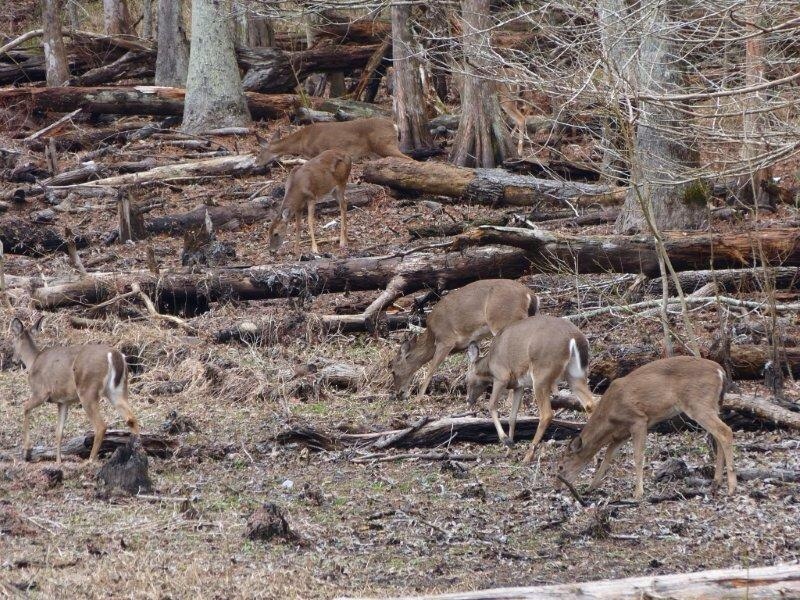 We were greeted by a herd of small deer in the wetland next to our site when we arrived yesterday afternoon. This provided Woolly Bear with entertainment well into the evening. He lies quietly and watches every move the deer make. And I watch WB to make certain he behaves! Deer grazing near our campsite. Birds are everywhere, as are turtles. But the alligators and snakes have not made an appearance due to the cold temperatures. Yesterday had a high of 46 degrees, and today may have gotten up to 56. 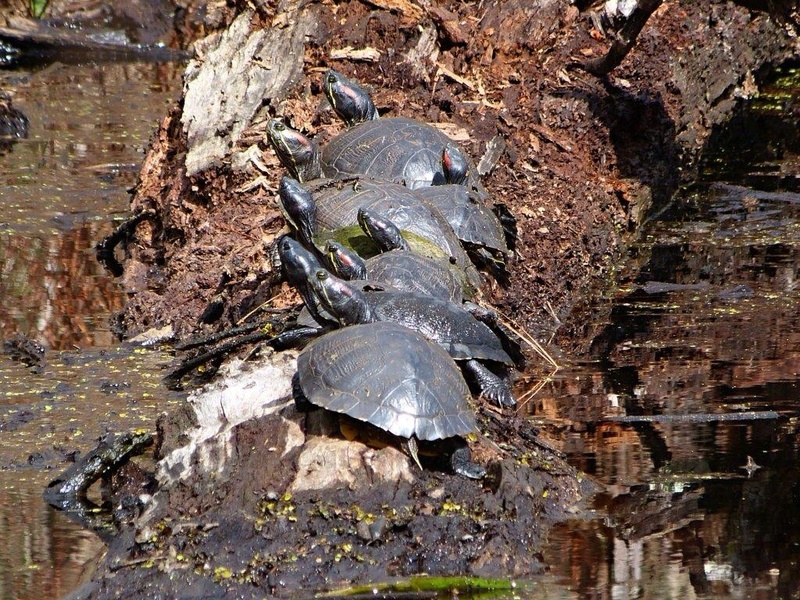 The sun did make an appearance and the turtles took the opportunity to sun themselves. Turtles huddled together to keep warm! We also saw a variety of wood peckers, flickers, yellow rumped warblers, and a large flock of blue birds. After our hike we sat outside in the sun and watched the deer grazing and the many different types of birds flitting around the marsh next to our camper. I imagine the mosquitoes would be horrendous if it were warmer, but right now there are none and it is nice. An Armadillo looking at Charlie on our hike today. This entry was posted in camping, Louisiana, Rving, Uncategorized on March 6, 2014 by Ramblin' Rose. Just loved the pictures of the wildlife especially the woodpecker! Thanks, Dot. Charlie gets all the credit for the pictures! Charlie’s pictures are truly works of art! He has a gift for photography…and your travels are certainly perfect pallet! Thanks, Liz. I shared your comment with him. I especially liked the armadillo looking at him! I see deer are everywhere. Enjoying all of Charlie’s photos. We had pileated woodpeckers in Trumbull but since moving here have seen only one. Hi Aunt Muff! Thanks for reading our blog. WB and I went walking this morning and had a little deer following us. My guess is that some people may feed them. WB was a bit of a handful, didn’t like the deer that close to us! Thanks, Di! There are benefits to cool weather when one is camped in a big swamp! We are having a great time. I am so impressed that you identify things like yellow rumped warblers! Do you have a bird book or do you just happen to know what these are? 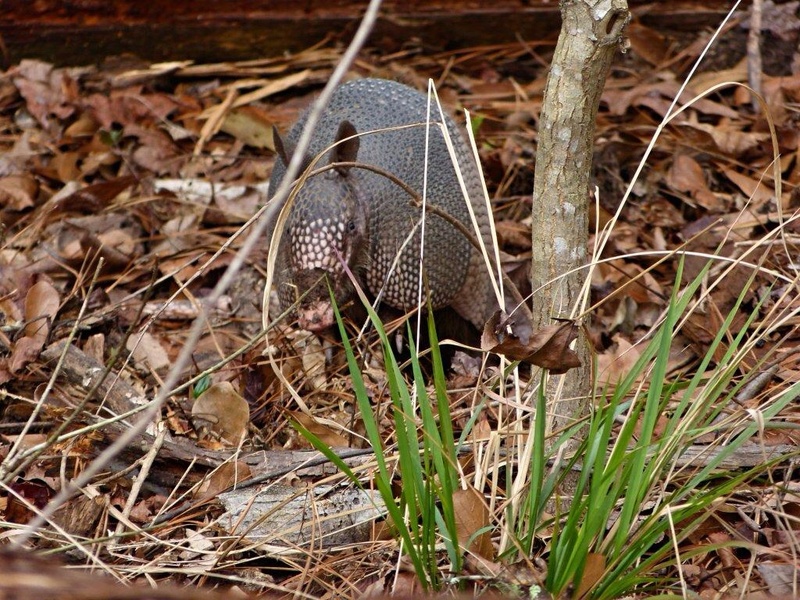 An armadillo that isn’t in a zoo…way cool. We have been trying to identify warblers for awhile, but we also have a few good bird books that travel in the camper. The armadillo was adorable, we watched him for quite bit.